SharePoint Framework API permissions significantly simplify connecting to APIs securing with Azure AD. There are however a few things that you need to watch out for or you will be stuck. Authentication is hard but security is necessary to ensure that your organization’s data stays safe. At the same time, it makes you spend more time than necessary trying to connect to your organization’s APIs. You have to decide which OAuth flow you need, what kind of Azure AD application to create, how to securely store the access token, not to mention to ensure that the whole setup will work with multiple web parts on the same page requesting access tokens simultaneously. For building SharePoint Framework solutions, Microsoft simplifies working with APIs secured with Azure AD through the AadHttpClient. The AadHttpClient abstracts away obtaining and managing OAuth access tokens allowing you to focus on building your solution. It just works. The AadHttpClient is invaluable and using it saves you a lot of time. Still, there are a number of things that you should be aware of so you do not to get stuck when using it in your solutions. Here are a few of them. AADSTS50001: The application named af71d8fc-bcb5-4e89-9415-71c8a1f1f585 was not found in the tenant named d4a29dc3-64ad-425a-971e-0acdea1bfa30. This can happen if the application has not been installed by the administrator of the tenant or consented to by any user in the tenant. 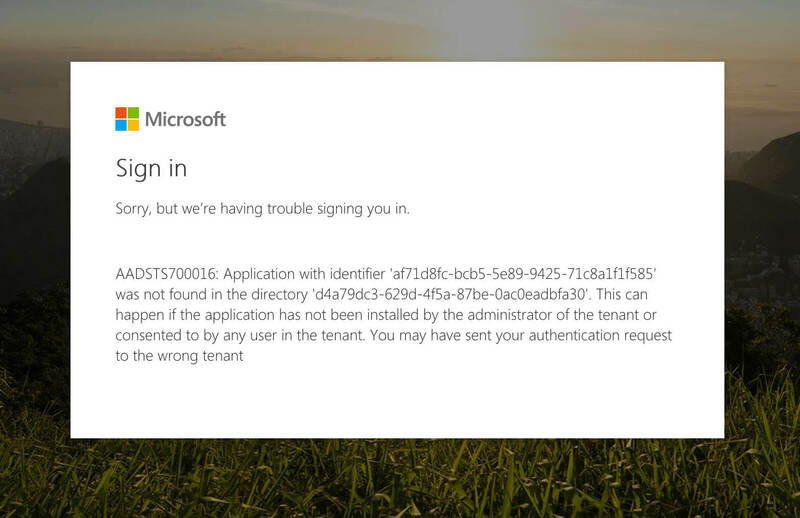 You might have sent your authentication request to the wrong tenant. This error occurs when your API is secured with an Azure AD application registered in a different Azure AD than the one used by your Office 365 tenant. This application hasn’t been consented by the administrator to be used in your organization. To fix this issue you need to complete the consent flow. You can do this in the web browser by navigating to the API URL, signing in with your Office 365 account and consenting to the usage of the API in your organization. You can confirm that the administrator has consented to using the application in the Azure Portal by navigating to Azure AD Enterprise applications. You do not have permission to view this directory or page. This is most likely caused by the fact that an Azure AD application with the same App ID URI is already registered in your organization. You should be able to confirm this by navigating in the Azure Portal to Azure AD Enterprise applications. To fix this issue, either change the App ID URI of the Azure AD application used to secure your API, or delete the old application from the Azure AD used by your Office 365 tenant. AADSTS50020: User account 'admin@contoso.onmicrosoft.com' from identity provider 'https://sts.windows.net/d4a49dc3-629d-4d5a-972e-0ac1e3dbfa30/' does not exist in tenant 'Contoso Dev' and cannot access the application 'af71d8fc-bcb5-4e39-9425-71c8a2f1d585' in that tenant. The account needs to be added as an external user in the tenant first. 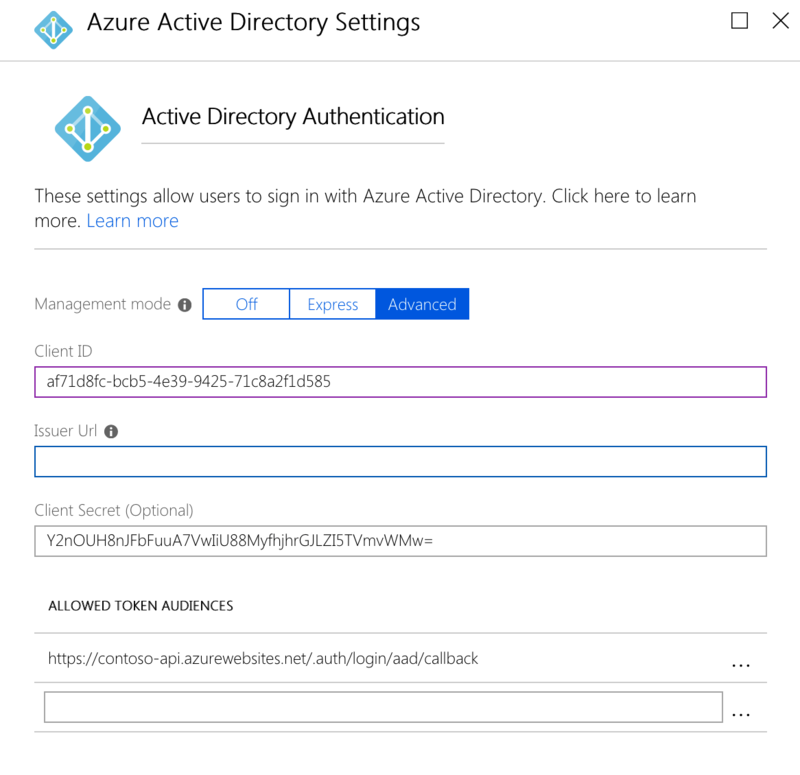 Sign out and sign in again with a different Azure Active Directory user account. AADSTS50020: User account '[email protected]' from identity provider 'https://sts.windows.net/d4a49dc3-629d-4d5a-972e-0ac1e3dbfa30/' does not exist in tenant 'Contoso Dev' and cannot access the application 'af71d8fc-bcb5-4e39-9425-71c8a2f1d585' in that tenant. The account needs to be added as an external user in the tenant first. Sign out and sign in again with a different Azure Active Directory user account. When securing the API using Azure AD, most likely you used the Express mode to create the Azure AD application. As a result, Azure AD configured the Issuer URL of this application to the Azure AD where the application is registered and which is different than the Azure AD used by your Office 365 tenant. As a result, Azure AD doesn’t allow the application to be used by accounts from other Azure ADs. To fix this issue, in the API authentication configuration, change the Azure AD configuration mode to Advanced and clear the Issuer URL. The IDs will, of course, be different and specific to your Azure AD and application. 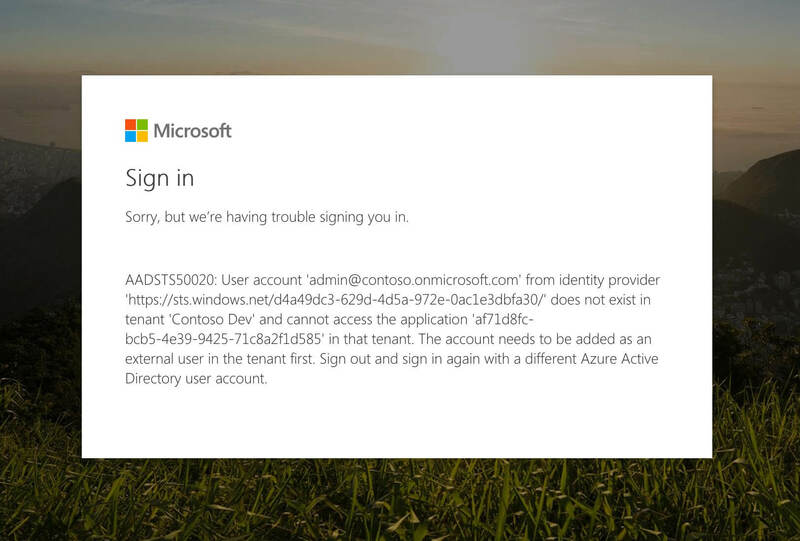 This error is being caused by you trying to use the API in the context of your Office 365 tenant, while the Azure AD application used to secure the API is registered as a single-tenant application in a different Azure AD than the one used by Office 365. To fix this issue, change the application to be multi-tenanted in its registration settings. A service principal with the name contoso-api could not be found. Specified clientId was not found. You’re trying to grant API permissions to an Azure AD application that is registered in a different Azure AD than the one used by your Office 365 tenant, while the administrator hasn’t consented to using the application yet. To fix this issue, you need to complete the consent flow. You can do this in the web browser by navigating to the API URL, signing in with your Office 365 account and consenting to the usage of the API in your organization. An OAuth permission with the scope user_impersonation could not be found. This error is often caused when trying to grant permissions for an Azure AD application registered in a different Azure AD and which has been deleted. 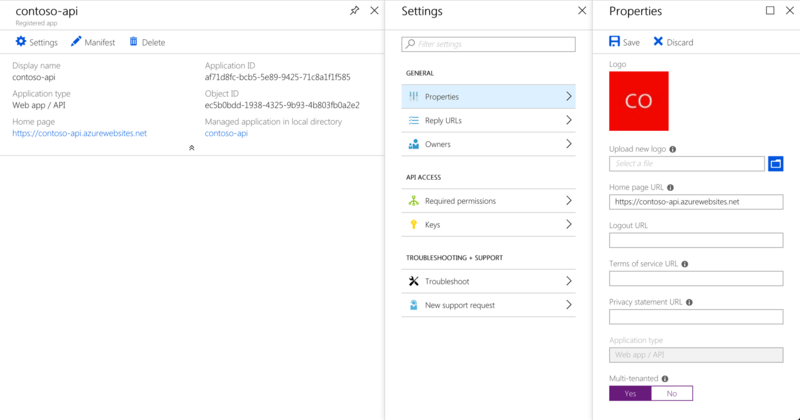 Unfortunately, deleting the Azure AD application in its original AD doesn’t remove the existing references, so while the Azure AD used by your Office 365 tenant would still be showing the Azure AD application in its list of applications, you will not be able to grant it any permissions. To fix this issue, create a new Azure AD application and use it to secure your API. AADSTS65001: The user or administrator has not consented to use the application with ID 'e6029062-a9cb-461d-924d-c3ab57a9c449' named 'SharePoint Online Client Extensibility Web Application Principal'. Send an interactive authorization request for this user and resource. 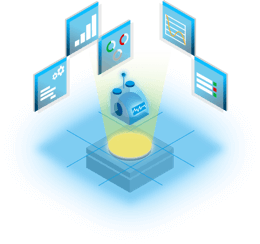 This common error is caused by the API permissions required by the component not being granted in the API management page. You should double check which permissions and to which APIs your component requires, and if they are granted in the API management. NetworkError when attempting to fetch resource. This error is caused by insufficient CORS configuration on the API that you’re calling. Because your component is communicating with the API client-side, the API must specify the domain of your SharePoint tenant in its CORS configuration, or the request will be blocked by the web browser with the aforementioned error. To fix the issue, navigate to the CORS settings of your Azure Function and add your SharePoint Online domain to the list of approved origins. SharePoint Framework API permissions significantly simplify connecting to APIs securing with Azure AD. To successfully secure an API using Azure AD and communicate with it from a SharePoint Framework solution, you need to be aware of a number of settings or you will be stuck trying to decipher the cryptic error messages. New vulnerabilities are discovered every so it’s it’s important to keep a tight grip on what happening with your API permissions. It’s not enough to audit your SharePoint applications and environment only once. Regularly analyzing your applications will help you discover any threats before they become an issue. Rencore simplifies it, allowing you to focus on helping your organization to stay secure. Try our free risk assessment today and be on the safe side.